Internal (seismic) activity remains low, but above background and the volcano's status is unchanged at yellow. Low-level seismic unrest continues with no significant changes to report over the past months. Seismic activity remains slightly elevated, with no significant changes over the past months, and INGEOMINAS keeps alert level yellow. Weak seismic unrest continued over the past weeks. The alert level remains at yellow. The only sign of acivtity over the past week were 4 small volcano-tectonic quakes. Seismic activity remains barely above background. During the past week, INGEOMINAS reported a total of 13 mostly weak-energy events. The network of electronic inclinometers for monitoring deformation showed stable behavior. Small earthquakes at shallow depth, 25 in total during the past 7 days, continued to occur at 1-6 km depth in an area 1-2 km N of the summit. Swarms of small quakes and longer tremor pulses appear on the seismic recordings and seem elevated compared to the recent days. Seismic unrest continues at Sotará. In the week between 5-11 Sep there were in total 82 events, INGEOMINAS reports. This includes about 50 small quakes of magnitudes between 0.1-1.6 at shallow depths of 1-6 km in an area 1-2 km north of the summit. Seismicity is up and down at Sotará volcano with periods of increased activity and small quake swarms of several hours alternating with quiet intervals. Weak seismic unrest continues. A number of quakes between magnitudes 0.1-1 were recorded 1-2 km north of the summit in an area at 4-5 km depth. Weak inflation of the NE sector of the volcano continues to be visible. A total of 71 volcanic quakes were recorded over the past week. Most were very week, but 6 had magnitudes between 0.1 and 1.3 and were located 1-2 km N of the summit at depths between 2-3 km. 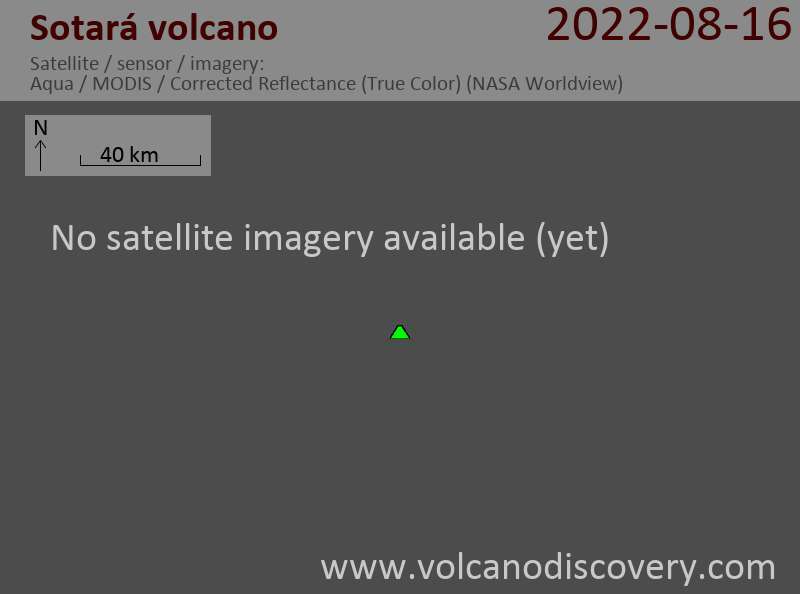 A possible inflation of the NE sector of the volcano is being detected on tilt meters. Seismicity has been on the increase at the volcano. Over the past 7 days, INGEOMINAS registered 151 volcano-tectonic quakes, out of which 15 were of significant size (magnitudes 0-1) and located at shallow depth between 2 and 6 km in an area 0.1-5 km NE from the the summit. Visual observations show no signs of surface activity. Seismicity visible at Sotará overall decreased during the past week, but showed a strong increase yesterday and then again subsided today. The increase had been detected on June 24, 2012 and since that date, 6891 earthquakes have been recorded, i.e. an average of 150 quakes per day. Most of them (5177) are of very small magnitude, but the remaining 1714 quakes were of significant energy (local magnitudes 0.1-2.2) and concentrated in an area between 0.1 and 5 km northeast of the volcanic summit at depths between 2 and 6 km. Volcanic unrest has been detected recently at Sotara volcano. An increased number of small volcanic earthquakes is visible on seismic recordings.